On Friday, I attended the funeral of a much-loved priest in our diocese. It’s not the first such funeral I’ve had the blessing of attending. I say “blessing” because, whatever the tragic circumstances surrounding a priest’s death may be, I find the funeral service for a clergy member–along with the preparations for it–to be among the most moving, ripe-with-resurrection services we have in the Church (with the exception of Holy Week services, of course). The funeral of Fr. Charalambos Elles (October 27, 2017; St. Nicholas Greek Orthodox Church, Toronto). My experiences over the last week of saying goodbye to this unforgettable servant of God have made me think a lot about what it is we do at funerals in the Orthodox Church, and why priests’ funerals, in particular, seem imbued with a certain energy, love, and hope. I think it’s because, in part, we put more time and effort into the end-of-life rituals for a clergyman. We show up, as a Church and as a Tradition, in a way that maybe we sometimes don’t when an “ordinary” layperson dies. That’s hardly a criticism–priests give their lives in service of the Church, a sacrifice their family members also share the burden of. It’s fitting and important we give back to them through prayer and remembrance as they make their final, heavenward journey. But I also believe the funerals of priests serve as icons or beacons of what death is and should be in our earthly perceptions. The way we mark their falling asleep–the rituals, the symbols, the prayers–hearkens back to an awareness of death and resurrection that in many ways has been lost in modernity. To clarify what I’m talking about, I compiled a list of ten ways a clergyman’s funeral differs from that of a layperson. Why is it important to be aware of these differences? First, it helps us as parishioners affirm and participate in the resurrection of the dead Christ enacted–in both our prayers for departed priest(s) as well as for our loving regard for their bodies and souls after death. Second, it helps us better “remember death,” as the Fathers admonished, so we can prepare for our own deaths and attend to those of our loved ones in a more distinctly Orthodox fashion. 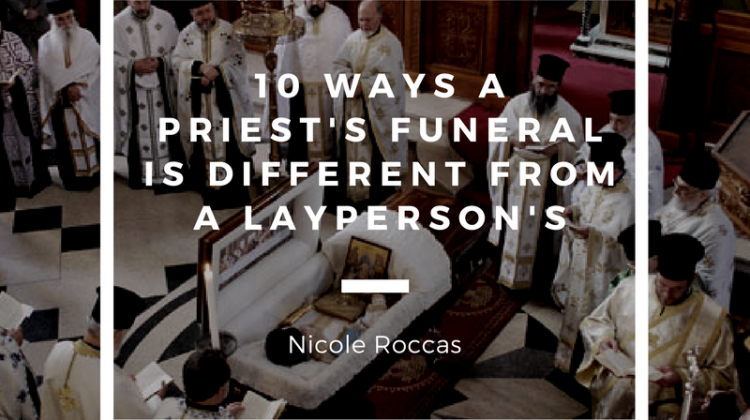 As you will notice, some (though not all) of the “differences” between the funerals of priests and lay people are not true differences–they exist solely because certain pious Orthodox traditions surrounding death and dying have fallen away over the centuries. Many funerary customs that are now unique to the priesthood were once commonplace for all Orthodox persons, lay or clergy. 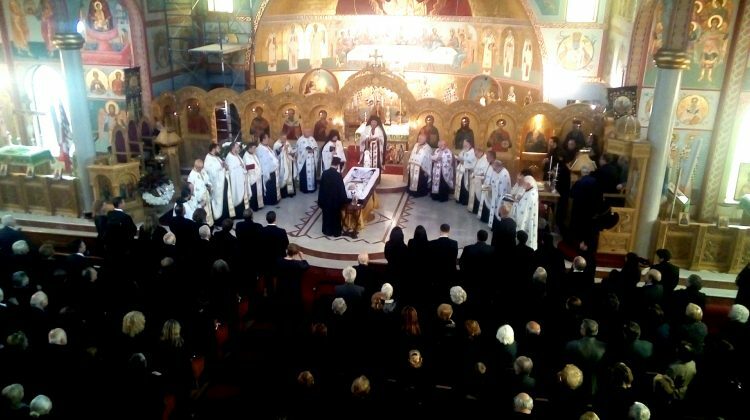 By watching and attending to the death of a clergy member, we relearn how rich and profound an Orthodox funeral can (and ought to) be, and how we might begin to reclaim some of these practices for lay funerals in the Church. After a priest has fallen asleep–and usually after his body has been taken to a funeral home–it is washed and anointed by other priests. (For lay people, this is a task typically done by immediate family members, though nowadays it is often left to funeral directors, sadly.) While this is taking place, the Psalms are read. Depending on the circumstances, immediate family members may be invited into the room while this is occurring, but they do not assist. 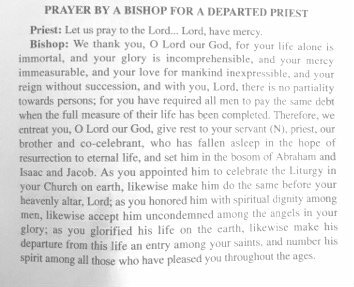 In our diocese, at least, there is no formal limit on the number of priests who may be present at this time–as many come as are able, given their other clerical duties (which, incidentally, may include liturgizing other funerals–death does not stop, even for another’s death). In my experience, priests revere this task as an honor and a privilege. I am always struck by how quickly and reverently my otherwise busy and over-worked priest friends and acquaintances find a way to drop what they’re doing and attend to this last act of care for their brother priest. After washing and anointing the body, the priest is vested (still by fellow priests) in the same vestments he would wear to celebrate a Liturgy, most often in the white color of Pascha. (I have found references to a custom of vesting the priest in the same garments he was ordained in, though that doesn’t seem to be very common based on the priests I’ve asked. I’ve also found allusions to vesting departed priests in brand-new vestments, but again this strikes me as unconventional, not to mention expensive.) According to Fr. Thomas Hopko, the vestments “indicate that at the Great and Final Judgment, [the departed priest] will be responsible not only for his own deeds but also for the flock that was entrusted to him.” This is sobering–as it should be–but the vestments also represent the grace of Christ. After all, one of the items the departed priest is vested in is his stole (Epitrachelion), which is a visual reminder of Christ covering all sins. Incidentally, the issue of vesting represents another area where funeral customs for the laity have diminished. 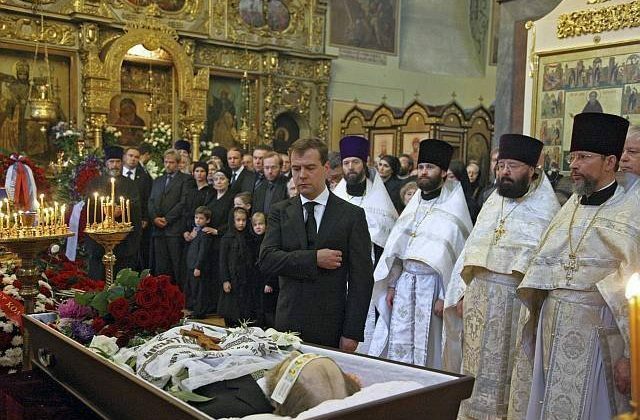 Historically, the Orthodox faithful were buried in plain baptismal gowns, not the suits and formal attire that we now expect at funerals (if you’ve ever seen the movie Ostrov, you’ll recall the main character of that film was also buried in a baptismal garment). I don’t know about you, but imagining myself in a baptismal gown after death drastically changes the optics of the ancients’ cry to remember death. Something about baptismal garments brings a life full circle, reminding me of what I’ve put on–or am supposed to be putting on continuously–in this life and in my death: Christ (Gal. 3:27). After washing and vesting the body, the brother priests place the departed in a simple and unadorned casket, usually made of wood. The kind of casket isn’t a formal rule, nor is it “covered” by Canons or the Typikon, which were written before the era of ornate, sealed metal caskets and indestructible burial vaults. But the priests I spoke with about this issue all went out of their way to emphasize the importance of having just a plain, wooden casket at Orthodox funerals in general, especially for priests. It reaffirms–and admonishes the flock they served–that our hope is in Christ, not in earthly comforts or status symbols. 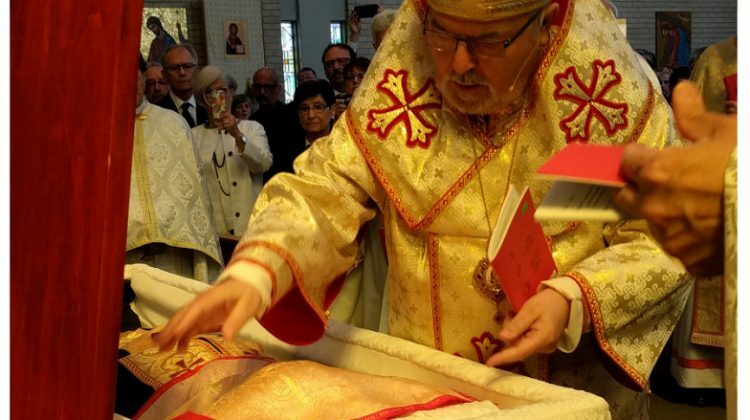 In the casket, the priest may be positioned so his right hand is in the shape of a priestly blessing. He continues to bless those who approach him during the viewing and the funeral. Once the casket is borne to the church, it is situated at the front of the nave just as anyone else’s would be. Often, his feet are placed toward the back of the church for the viewing (so he is facing the congregation). Before the funeral, however, he will be turned, “as though, if he were to sit up, he would be facing the altar and the East,” Fr. Ted explained. This is no different from that of a lay person, but in the case of the priest, the casket is often left completely open–even the feet are visible. To do this, the lid of the casket is taken off its hinges and placed elsewhere until later. I have to say, this slight change–seeing the whole body of a person who has fallen asleep–completely alters the aesthetic of a funeral. I never realized how strange and discombobulating it is on a subconscious level to encounter a half-hidden dead body, which is all you get at a typical open-casket funeral. I’ll never forget the first time I went to a priest’s funeral and gazed at his whole body. For some reason, I couldn’t stop staring at his feet. I kept noticing how he was wearing shoes–the same, well-worn black shoes he wore during liturgies. There was something so endearing and human about that–I had never before seen a person’s feet in this setting, and something about it helped me wrap my mind around the fact that that was a whole person in that casket. A child of God. Why don’t we show the whole body at all funerals? There’s no reason not to. On a slightly humorous (and oddly profound) note, at one viewing I attended, people started going up to the priest’s casket and peeking in bewilderment at the bottom of his shoes. Then they’d walk back to their pew with a smile. I was standing next to one of the priest’s daughters and had no idea what was going on. “Go up there,” she nudged me, smiling through her tears. “Look at the shoes. There’s something there.” I approached the casket and peered at the rubber treads. Near the heel of one of his feet, a neon red smiley face sticker clung to the shoe and peaked up from the billowy, white satin in the casket. I almost started laughing–what a disarming absurdity, a smiley face sticker at a funeral. “We found it on the bottom of his shoe when we were cleaning them at the funeral home,” his daughter explained. “He must have stepped on it the day he died without realizing–that, or he put it there as a little joke for us to find later,” his daughter grinned. “We cleaned the shoes but decided to leave the sticker.” Yet another instance when death and sorrow didn’t get the final word on a person’s life. Across the priest’s chest are placed a Cross (the emblem of salvation) and the book of the Gospels (which the priest “worked to proclaim” in his ministry, according to Fr. Thomas Hopko). Often, these items are arranged as though the priest is holding them for people to venerate–just as he would hold the Gospels during Orthros, or the Cross following a Divine Liturgy. During the viewing that occurs typically the day before the funeral, it is customary for people to venerate both the Cross and the Gospel that are in the casket. Which leads to an important (if awkward) question: do you kiss the priest’s hand? The first time I attended the viewing of a priest, I suddenly found myself in front of his casket with a line of people behind me and absolutely no idea what to do. If you’re ever in this position, take your cue from Fr. Ted’s words above: “as in life, so in death.” Venerate the Gospels and the Cross as you would in a normal liturgical setting, and then–if you want–the priest’s right hand. Some folks are squeamish about this, and that’s okay. But if you find yourself wanting to kiss the priest’s hand, go right ahead–it’s a respectful and compassionate desire. It bestows honor and love on the departed priest, and helps facilitate the grieving process for you. But more than anything, it affirms our belief that we serve a God of the living; He sent His Son to vanquish death and fulfill the Law that once regarded dead bodies as ritually impure, something to be kept at a distance. For my part, I did kiss that priest’s hand (as I’ve done and will continue to do at every subsequent priest’s funeral) and, far from awkward, it felt natural and right. After the viewing that occurs the day prior to the funeral (and concludes with the Trisagion Service), the departed priest’s body will remain in the church overnight. Traditionally, other priests and/or lay members keep vigil the entire night, though this is frequently curtailed in modern times to a few hours at most. When other priests are present, they take turns reading through the Gospels continuously until Orthros the next morning, cycling back through the Gospels as many times as is necessary. At times when there is not a priest present, lay readers may chant the Psalms. The all-night vigil is another tradition that is not–or need not be–so different from the typical funeral of a layperson. In earlier periods of the Church, it was customary for all the departed–clergy or lay–to remain in the church building overnight and be prayed or chanted over. Nowadays, many prefer their loved ones to remain at the funeral home until the time of the funeral (which is typically the day following the visitation). This is slowly changing; our diocese, for example, now actively encourages and educates families to bring their departed loved ones into the church the night before the funeral. Most priests I know would also be willing to work with family members if they wanted to organize a small vigil gathering and stay in the church with their loved one as well. It’s a beautiful and historical practice that we’d do well to consider and re-appropriate into our modern practices. From Evagrius Constantinides, _The Priest’s Service Book_ (Merriville: Melissa Printing Company, 2008). Another difference is that at the end of the funeral service, before the burial shroud is administered (which also occurs in a lay person’s funeral), the priest’s face is covered with the sacramental veil (aer), the cloth that ordinarily covers the Holy Gifts. 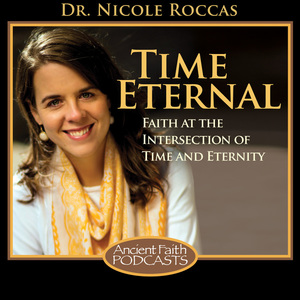 This recalls how the priest dedicated his life to serving and administering the Holy Mysteries of God. Some jurisdictions have a parallel practice of covering a lay person’s eyes with a chaplet (small cloth headband). In my research, this seems to be more common in Russian Orthodox and ROCOR churches–I would love to hear from any priests out there who can comment on the meaning of this practice. 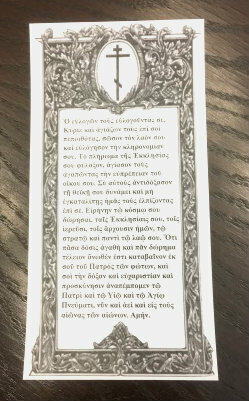 After the funeral, during the committal service (at the graveside), it is customary in some jurisdictions to place a small scroll with the Prayer Behind the Ambo in the departed priest’s right hand. This is essentially the dismissal prayer of the Liturgy–the priest is being dismissed from his earthly ministry and entrusted to his heavenly one. 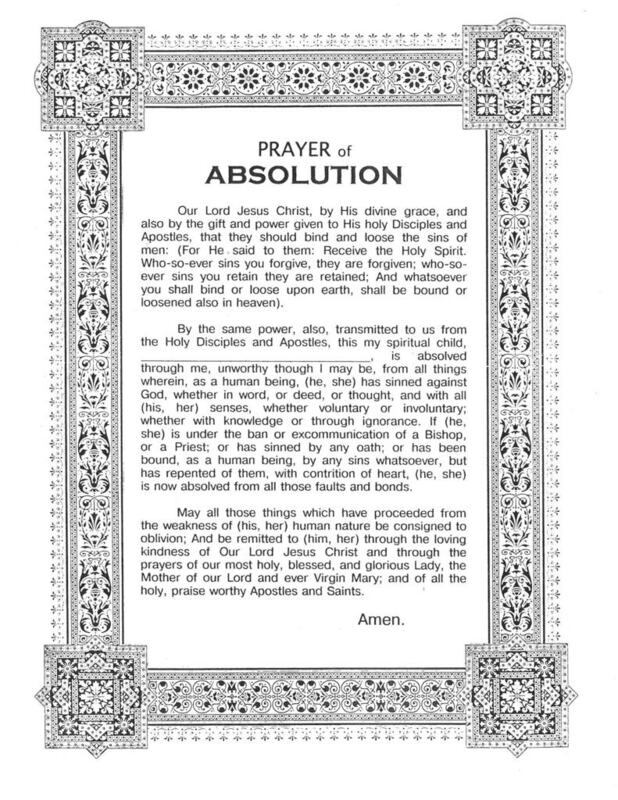 This recalls a similar traditional custom–not always practiced today–in which the Prayer of Absolution is placed in the hands of a lay person after their funeral and before their burial. So much for the ten differences–more could be said on this vast topic of attending to death, but I chose to highlight the most profound and edifying facets of a priest’s funeral. I’m also aware there’s a degree of variation across the locales and jurisdictions of Orthodoxy in terms of funerary practices. If you’re an Orthodox priest or lay person with experience in these matters, I would love for you to chime in with your thoughts and experiences in the comments below! How we regard death and how we care for the dead greatly affects the living–it alters how we view life and our purpose in it, and it even acts as a witness to the larger modern community. And yes, Christ said to let the dead bury their own dead–but it was also by tending to Christ’s body that the resurrection was first stumbled upon and transmitted (more on that, God willing, in a future post). For me, funerals–particularly those of clergy–never fail to draw my gaze past the veil of death and to the hope of the resurrection. In dispelling some of the differences and similarities between clergy and lay funerals, I’ve sought in my own meagre way to do the same. He was buried with the glory and honour befitting a simple man who served with the same Graces…..allthewhile maintaining a deep humilty. May his memory be eternal!! We also had a funeral for a priest last Friday in our diocese, and we buried a parishioner earlier Friday. It was quite educational. May their memories be eternal! +++ Thanks for stopping by, Lawrence. I’m from a ROCOR church, and from what I’ve seen the “chaplet” isn’t placed over the deceased person’s eyes but on their forehead. I believe it is meant to symbolise a crown if anything. The “chaplet” you’re talking about is a decree of absolution from the departed’s spiritual father or father confessor. In the Slavic practice, it’s printed on a headband (alternatively, the headband features the Trisagion hymn) and placed on the head of the departed. 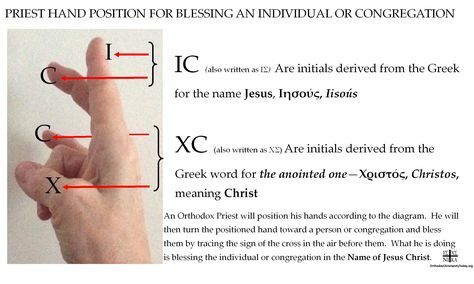 I understand (though I have not seen) that it can also be placed on a paper in their hand, as you describe the Prayer behind the Amvon, above. My understanding is that, at least with respect to the Eparchy of St. Nicholas for the Ukrainian Catholics (Chicago, Illinois), each priest is required to have a set of vestments designated for his funeral.